Okay, I know I haven’t posted for 5 days! Yes, I’m still alive! lol I just haven’t felt like posting! 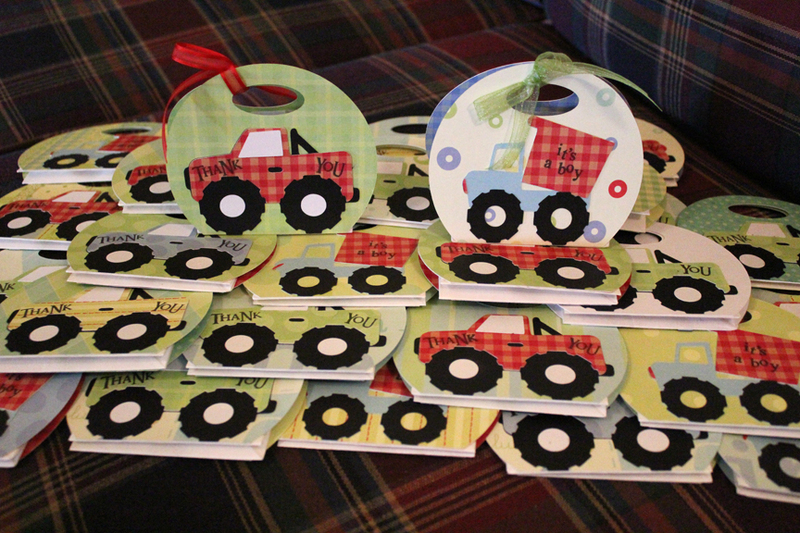 I also have been working on the baby shower thank you gift bags for Amy’s baby shower in a couple of weeks. I finished 31 of them…hopefully that will be enough! I will fill them with candy closer to the party date. The all have one side with a dump truck that says, “it’s a boy” and the other side is a monster truck that says, “thank you”. The invitations have been mailed too. This entry was posted on Thursday, April 7th, 2011 at 6:33 pm and is filed under Uncategorized. You can follow any responses to this entry through the RSS 2.0 feed. You can leave a response, or trackback from your own site. Oh my! What lot of work, but those are awesome! Great job. Chrissie’s idea! A perfect one I thought too!! Those Shower bags are really cute I’m sure all the girls will love them…you are so creative.